(May 9, 2012) -- Development of oil and natural gas in the Eagle Ford Shale contributed $25 billion in total economic output to the region in 2011, according to a study released today by the Center for Community and Business Research at The University of Texas at San Antonio Institute for Economic Development. "The Eagle Ford Shale has proven to be one of the most important economic engines in the state," said Thomas Tunstall, director of the UTSA Center for Community and Business Research and the study's principal investigator. "In 2011 alone, the play generated over $25 billion in revenue, supported 47,000 full-time jobs in the area and provided $257 million in local government revenue." And spurred a triple-digit sales tax revenue increase in various local counties. The increased revenue from the Eagle Ford Shale is rebuilding local communities. New schools and new hospitals are being built, and new training programs have been launched to maximize hiring from the local workforce. The study projects the creation of approximately 117,000 full-time jobs by 2021. "The residents and local leadership of South Texas have taken a proactive and collaborative approach to this new economic opportunity, which we hope demonstrates how communities can embrace, invest and manage this new influx of revenues to ensure long-term regional prosperity," said Leodoro Martinez, executive director for the Middle Rio Grande Development Council and Chairman of the Eagle Ford Consortium." "Through the Eagle Ford Consortium, Eagle Ford Task Force and other community-industry collaborations, Eagle Ford leaders and residents are working together to develop training programs, enhance local employment opportunities and forge solutions to community issues that maximize the benefits and manage the effects from increased development activity. The Eagle Ford Shale is a 50-mile-wide by 400-mile-long formation that runs from the southern portion of Texas to the east. The formation produces natural gas, condensate, oil and natural gas liquids with margins more favorable than other shale plays. The study assessed the economic impact of the Eagle Ford Shale on the 14 counties currently producing oil and natural gas from the formation, as well as the six surrounding counties indirectly involved in its development. The UTSA Institute for Economic Development Center for Community and Business Research conducts primary research on community and business development in South Texas and the Border Region. For more information, visit the IED Center for Community and Business Research website. 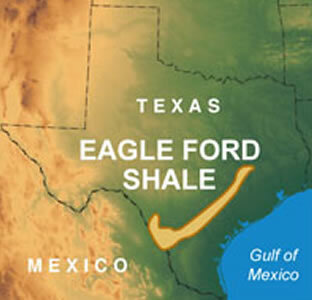 >> Download UTSA's Eagle Ford Shale study.